We ended the year with a little vacation to Yosemite National Park with some friends. Wife wanted couple of pictures to hang on the wall and also she hadn’t seen a snow covered Yosemite and her reaction was priceless! It was first time for the kids too, but they were more happy playing in the snow than the scenic beauty. 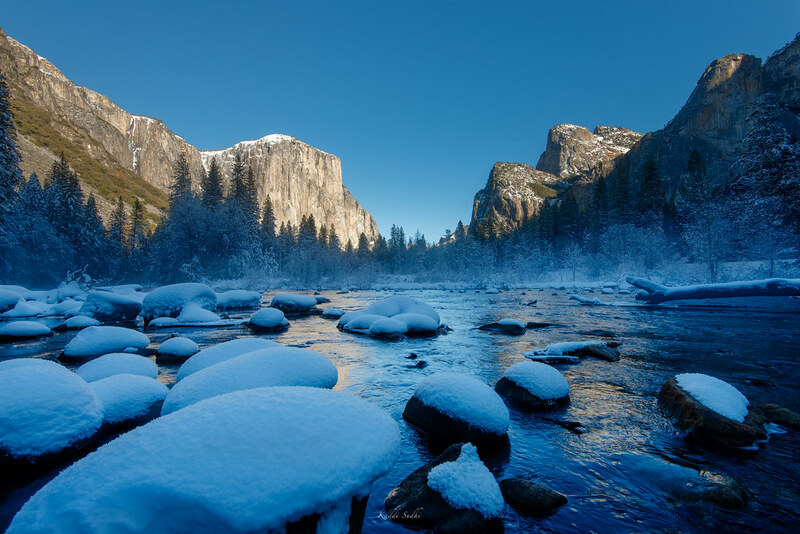 A white winter followed by a green spring would be my favorites of Yosemite. Thanks to El Niño, it’s very promising to get that this time. If you were ever thinking about a visit to this park, make sure to visit before the snow melts – it’s really magical in winter. I was looking to get a 16:9 black and white picture and I did process this very scene in black and white, but somehow this color image does a better job in conveying the feeling I had on that morning much better. A slight mist, snow cover all over with an icy feel and with ample sunshine was how we were greeted that morning. My only regret was that a single malt delayed us to get to this place for catching the morning glow. I’ll be sure make more visits to this place this winter. Best wishes for the year ahead and may you get the strength to fulfill your goals!